BIOTERROR WITH A TWIST-PRO SE THRILLER OF THE WEEK-‘THE OUT-OF-TIMERS: FEVER’ DEBUTS FOR $1.49! Pro Se Productions Presents the Latest Episode of the Future of Digital Storytelling-THE PRO SE THRILLER OF THE WEEK. Three people, each experts in their respective fields, and near masters in many things. For different reasons, they are considered to be not long for this world, living on borrowed time. They each have also been known to be risk takers, daredevils of a sort, so even without their own individual issues, they could, at any minute, put themselves in situations that could take them out. They are brought together as a group by a man known only as Mister Davies to form the most unique of teams. Working both on individual missions and as a group, The Out-Of-Timers are sent on jobs to confront evil, help those who need it, and save the world. Deadly Diseases in a Designer World! A relief hospital is attacked in Africa, its staff massacred. The mysterious Mister Davies puts his three best operatives into play to determine if terrorism, rebellion, or something more sinister is at play. Between globe spanning espionage, death defying action, and stunning, horrifying science, the aged spy, the terminally ill scientist, and the marked ex cop uncover something that they've never seen. A plot that may mean the entire world is Out of Time. THE OUT-OF-TIMERS: FEVER by Davide Mana. Concept created by Tommy Hancock. 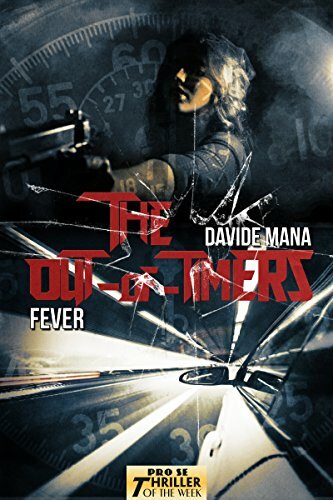 Featuring a thrilling cover, logo design, and formatting by Antonino Lo Iacono and Marzia Marina, THE OUT-OF-TIMERS: FEVER is available now at Amazon at https://www.amazon.com/dp/B0786PCJS9/ref=sr_1_1?ie=UTF8&qid=1513010894&sr=8-1&keywords=out-of-timers+fever for only $1.49. And this episode is a part of Kindle Unlimited, so KU Members can read it for Free! ESPIONAGE IN THE STARS! JILLY PADDOCK’S ‘STARCHILD’ DEBUTS! CYBERPULP! ‘BELT CITY’ DEBUTS FROM PRO SE PRODUCTIONS!